Focusing on needs. When everyone’s underlying needs are acknowledged and addressed, creative, sustainable and robust outcomes are possible. Owning the outcomes. We offer skills and support so you can develop the best solutions for you, your team, your agency or your community. Building cultural humility. We provide guidance in how to approach challenging conversations with empathy, respect and understanding for all. Embracing differences. All types of diversity contribute to a strong community. We bring people together to find common ground and achieve win-win resolutions. PCRC’s key areas of focus are empowering youth, strengthening families and engaging communities. Engaging Communities means creating opportunities for all people in our communities to have a say in the decisions that affect their lives. Recognizing that people feel a sense of responsibility and ownership when they are able to shape the decisions that impact them, PCRC helps to empower individuals and groups to become involved in processes to which they have historically lacked access. PCRC’s Engaging Communities Initiative works with groups to address issues that affect their neighborhoods. Youth violence, health disparities and drug and alcohol abuse are just a few examples. Through facilitated dialogue and structured community meetings, PCRC helps create safe spaces where people can partner with local police, nonprofits and businesses to find sustainable solutions to social challenges that are often based on cultural differences, linguistic barriers, obstacles to accessing health care and socio-economic inequities. Families are the foundation of thriving communities and in order for them to connect to opportunities that improve the quality of their lives, they need to actively engage with schools, neighborhoods and service providers in their communities. PCRC’s Strengthening Families Initiative helps families access resources and gain both communication and leadership skills. These skills help them better navigate the educational system, break down cultural barriers and improve communication with their children. Families continue to use these skills in all facets of their daily lives. PCRC and the San Mateo County Office of Education have partnered to create the Friday CAFE, which brings family engagement providers and administrators together from schools, nonprofits and government agencies to learn from one another and share best practices. Empowering Youth means creating opportunities for young people to thrive, learn and give back to their communities. It includes empowering young people to think critically, communicate effectively, interact constructively and express themselves creatively. The goal is to achieve lasting change that enhances and builds relationships between students, faculty, staff and parents, improves student behavior, reduces violence and creates a sense of community. PCRC’s Empowering Youth Initiative works with youth to develop leadership and communication skills, cultural identity, volunteerism and self-advocacy. Our “whole school community” approach increases family engagement and student success while restorative practices improve teacher-student relationships and school climates. For at-risk youth, this means encouraging participation in processes to resolve problems peacefully rather than resorting to violence, and partnering with other youth-focused agencies. When conflicts arise, our mediation services can help you identify shared interests, generate options and solve problems collaboratively. Our trained volunteer mediators will guide you through a fair and balanced process to help you reach a mutually satisfactory resolution. Our four-step model is effective: People reach resolution 80% of the time and uphold their agreements. Our facilitation services provide a framework for groups to work together more effectively and efficiently to achieve their desired objectives. 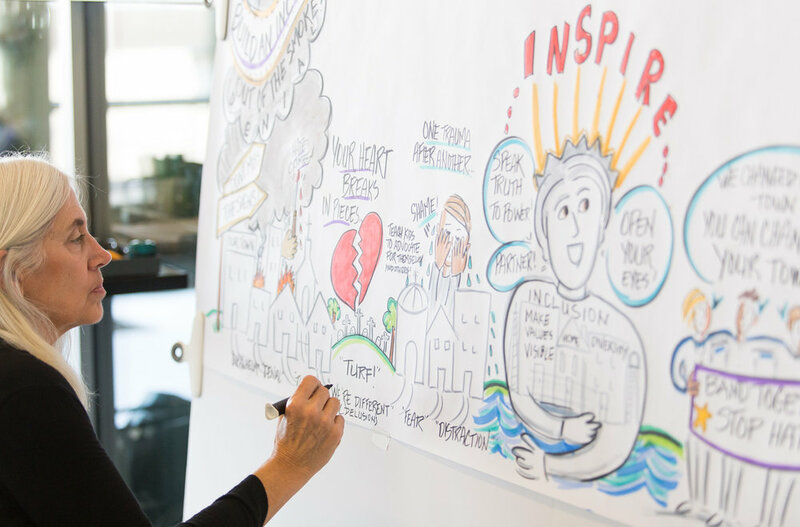 Whether it be a public engagement dialogue, town hall, staff retreat, strategic planning session or board meeting, our team of highly skilled facilitators will design inclusive, participatory processes customized to your specific needs. Our workshops focus on skills development to improve performance, effectiveness and overall success. We work with nonprofit organizations, agency service providers, businesses, neighborhood groups, local governments, schools, parent groups and youth groups. We also design customized curriculums. Our conflict coaching services provide confidential, one-on-one sessions with a coach trained in conflict resolution and communication skills. Because you know your situation best, your conflict coach will serve as a sounding board and accountability partner to help you gain insights and design action-oriented approaches to addressing personal or professional challenges. Our restorative approaches to repairing harm through inclusive dialogue provide alternatives to punitive disciplinary measures while positively impacting school culture and addressing academic needs. We work with district and school administrators to create comprehensive restorative initiatives that can be integrated into all aspects of student life. Our violence reduction work takes many forms, ranging from conflict transformation training in local jails to youth engagement activities designed to discourage gang involvement. Our teams strive to meet people where they are to help them reduce violence in their communities and create safer environments where everyone can thrive. Our outreach services are designed to make it convenient for your group or organization to take advantage of the wide range of services PCRC has to offer. To learn more about how we can partner with you in achieving your goals, invite PCRC for a free, interactive workshop and discover the many ways we can provide skills building or facilitative support when the time is right. If you’re not sure which PCRC services are right for you, don’t worry. We’ll work with you to develop a customized solution that meets your needs. Let’s talk!